Organizers hope to make the jubilee an annual event. More than 200 attended the daytime events and another 300 attended the evening performance by Hot Club of Cowtown, a folk group that formed (surprisingly) in New York City and has since toured with Bob Dylan, Willie Nelson and the U.S. State Department as musical ambassadors in several Middle Eastern countries. Lectures by guest speakers and Kansas Studies Institute staff gave context to the customs and folklore shown on stage. “If there is no market, there are no cowboys,” said Jay Antle in a talk on meat eating habits and the cattle economy. Antle, executive director of the college’s sustainability center, discussed the cattle trade’s ties to health and wealth across a century of meat. 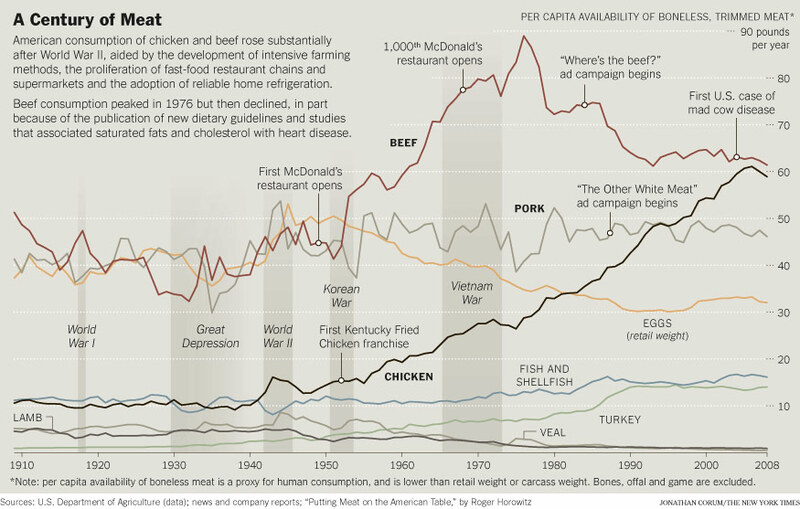 American beef consumption rose substantially after World War II, a result of intensive farming methods, home refrigeration and the proliferation of fast-food restaurants. Antle traced a steady incline between 1955, when McDonald’s was established, and 1968, when the 1000th restaurant opened. But since its peak in the mid ’70s, consumption has declined due to health initiatives, higher prices and a shrinking beef supply. Behrmann said the event was also meant to bridge a different kind of gap — that between the community and its historic cowtown. Between performances, attendees roamed lobby exhibits that featured a stagecoach, saddles, bronze sculptures and paintings of sprawling skies. Adelaide Everett of Shawnee twirled a red-speckled rope that she’d earned during an earlier onstage appearance with Tipton, the trick roper. She’d mastered six tricks so far of the 100 that Tipton recommended for her repertoire. “I thought this would be boring, but it’s actually not,” Everett said with the charming authenticity of an 8-year-old. At one of the last daytime events, a small group gathered for a performance and songwriting session by Andy Wilkinson, an award-winning singer, songwriter, playwright and poet. Wilkinson is an artist in residence at the Southwest Collection at Texas Tech University and also a visiting assistant professor in the School of Music. Wilkinson taught the fundamentals of songwriting and performed several originals, recalling the times a song was formed from a single, spoken line. He urged the importance of the natural writing process over the finished product — in true cowboy custom.